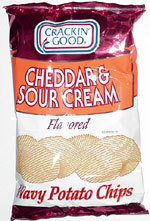 Taste test: These are pretty good potato chips, if you're into lots of cheddar and sour cream flavor. They've got a generous coating of flavor powder, and you can taste both the cheddar and the sour cream. There's even a nice orange glow to them. Smell test: A fairly strong cheddary, somewhat sour creamy, smell. Not bad. Trivia: Despite the fact that these are a store-brand competitor to snack industry powerhose Frito-Lay, these were found on a cardboard display case provided by Frito-Lay. At 89 cents, they were a good value. 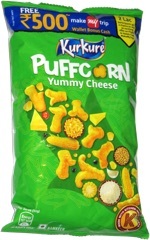 This snack was discovered by Jeremy at Winn-Dixie.